Christian Brerewood (sometimes referred to as Christiana) was born in Chester in 1659 to John Brerewood (1616 – 1700) and Sidney Gamul (1634 – 1665). She was christened at St Marys on the Hill Church (now the St Mary Centre) in the centre of Chester on 14 October 1659. Margery was born of unknown parentage in 1816, probably in the Wigan area of Lancashire. 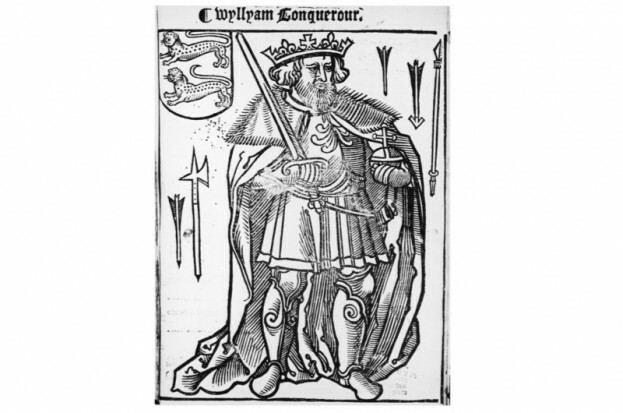 Born in Watford, Northamptonshire (near the modern day Watford Gap Services on the M1 motorway) in 1080 to unknown parentage, Agnes married Rafe de Arderne (1057 - ) of Warwickshire at Watford in 1113. Just nine years after the world’s first ever railway death (MP William Huskisson in 1830), one of my ancestors, Lydia Saunders was killed on the Liverpool to Manchester railroad in Whiston on Friday 12 July 1839. This newspaper article from the Manchester Mercury of 20 July 1839 tells the story. My great aunt Hilda Heywood was born in October 1909 in Bolton to Ellen Eliza Hindley and Ernest Heywood. She was their eldest child. In April 1911, at the time of the Census, she was living with her parents in Burnley, but by the time she was five, at the birth of her brother George Ernest Heywood (my grandfather) in 1914, she was living in Liverpool. Over the coming few years, she had three brothers, Harold, William, and Leslie, and a sister Emily, all die in their infancy. Another sister, Gladys, was born in 1924, and lived until 1997, and another brother Alfred, born in 1928, survived until 1977. At the age of 21, in 1930, Hilda married Joseph Devine, a hotel worker. They had two children, both of whom died young, and a third child, Muriel in 1931. In February 1938, Muriel had dressed in an old dancing dress and a paper head dress to show off as Mae West to her grandmother (probably Ellen but possibly Joseph's mother). She then sat down to write a letter to her mother. 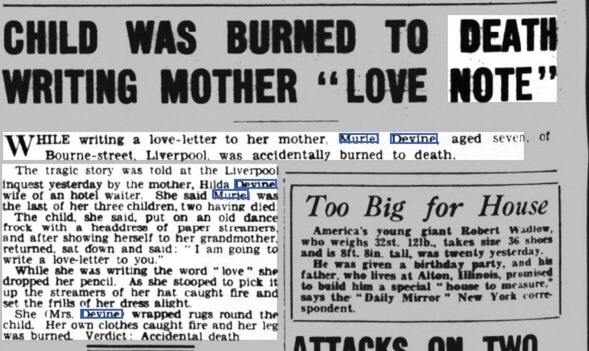 Newspaper reports from the time state that after writing "I love you" she dropped her pencil, and when she went to pick it up off the floor, her headdress caught the open fire, and soon her whole outfit was alight. Hilda wrapped her in a rug, injuring her leg. Sadly Muriel died of her injuries and shock on Saturday 19 February 1938, aged just seven years old. Above, taken from Daily Mirror, 23 February 1938. 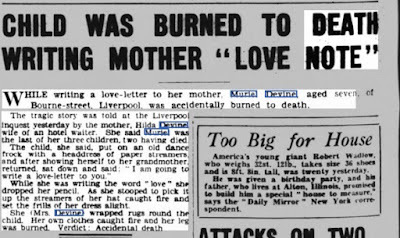 Below, taken from Liverpool Echo, 22 February 1938. Hilda divorced Joseph in October 1939. She is pictured below with her second husband William Smith (married September 1940). Both daughters emigrated to Australia, but Linda must have come back as she died in Birkenhead. William Smith was born in Liverpool in 1910, his parents were William Barker Smith (born 31 Dec 1880) and his wife (married 5 Aug 1907 at St Mary the Virgin West Derby) Henrietta Dures (whose father was Thomas William Dures, a wood turner). William Barker Smith was the eldest son (second child) of George Barker Smith (1846-before 1907) and Sarah Annie Smith (born 1846). His siblings were Emily E Smith (born 1879 Aintree), Thomas B Smith (born 1883 Liverpool), Valera Margaret Smith (born 1886 Walton), and Daisy G Smith (born 1889 Liverpool). Any information on anyone mentioned above gratefully received, in Particular the death dates of William (possibly 1975) and Hilda. Thank you. Agnes was born in c1080 to Guy (Wido) I, Count Of Ponthieu. Her mother is unknown. In 1100, following the death of her brothers Enguerrand and Hugh, Agnes became heiress to Guy upon his death. She was married (arranged by William the Conqueror) before 1087 to Robert De Bellême, 3rdEarl of Shrewsbury. He treated her badly, imprisoning her at Bellême Castle. She eventually escaped. Her husband was imprisoned in 1112, by Henry I Beauchamp. 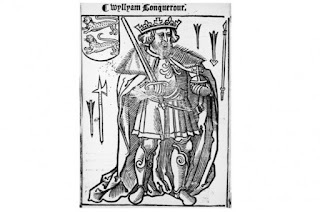 Agnes by this time had died, so her son by Robert, William III Talvas succeeded her.